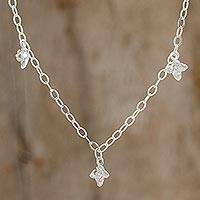 Crafted of sterling silver, petite jacaranda flowers bloom around this necklace from Costa Rica. Gabriela Romero designs the lovely necklace, circling the wearer with high-polish sterling cable chain. Thai artisan Sarote Lochotinunt send a message of love with this original necklace. Crafted from sterling silver with a brushed finish, the necklace is a unique and romantic way to declare your love. Artisan Abdul Kadir Iddrisu of Ghana crafts this long necklace with amethyst chip beads. 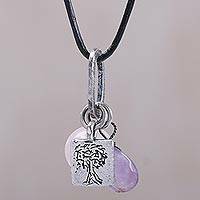 All the myriad of hues of purple, from light to dark, are showcased in this necklace. A modern necklace reveals its heritage in a traditional Indian design. 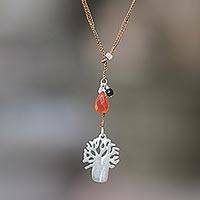 Finely crafted of sterling silver, the pendant embraces sunny carnelian in a necklace from Shanker. Designed to fall gracefully, this beautiful necklace is studded with marcasite. Thailand's Narinee designs this sterling silver necklace crafted with a Cuban link chain.